Badass blade of the week! How you should prepare for the EU referendum result. Cellblok. The only product to stop phone hacking – why you need one. Deciding between a fixed blade and a folding blade can be difficult. A fixed blade knife tends to be stronger with less maintenance, but needs a sheath if you want to be mobile. Folding knives can be harder to clean, particularly when trying to remove fish guts from the folding mechanism (don’t worry, we’ve all been there! ), but they tend to be more convenient for day to day use. It’s important to know that in the UK it’s illegal to carry a fixed or locking blade knife. We decided to go and find out more about fixed and folding blades to help you decide which knife suits your needs. 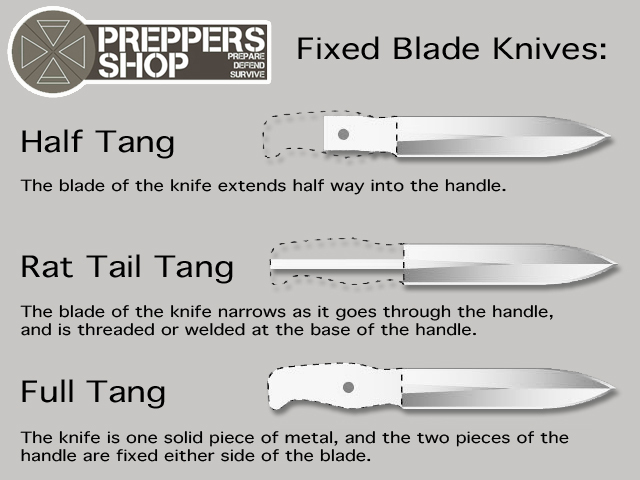 A fixed blade knife is a knife where the blade extends down into the handle. Due to their design, they tend to be more hard wearing… It’s basic physics, with a fixed blade the blade can be longer, with a secure mounting point, so therefore it’ll be a stronger knife. This is the strongest knife construction. It means the knife is one solid piece of metal, and the handles are two pieces which are pinned to the sides of the blade. Half tang knives go to the full length of the knife handle, but only half of the width. This means that the blade of the knife tapers at the handle end, and is pushed into the handle. The blade will be secured by an adhesive or epoxy. They’re usually either Full Push or Half Push – Full Push means the tang extends the full way into the handle, Half Push means it only goes half way. With a Rat Tail Tang knife, the tang of the blade narrows as it goes through the handle, and is threaded or welded at the base of the handle itself. This is a secure way to fix a blade, and means the handle can be replaced if necessary. In this case, the Tang is smaller than the handle, and the handle is moulded around the tang to accept the blade. Technically speaking this is the weakest configuration, but knives of this construction tend to be small, lightweight and specialist. Preppers Shop UK was founded in January 2014 to meet the ever growing demands of UK preppers. With ever growing instability worldwide, be it financial, military or enviromental, problems are imminent and showing ever increasing signs of problems arising rapidly. If you are not prepared your chances of survival are extremely slim. Whether you are looking to start prepping and looking for the best way to start or are an experienced prepper looking to add the final pieces to your kit, We have everything you will need. Want to blog for Preppers Shop UK?